Note to self: always keep an open mind, no matter what. Which I try to do anyway, it’s just I don’t always manage to stick to this mantra – but I’m only a human and not perfect at all! 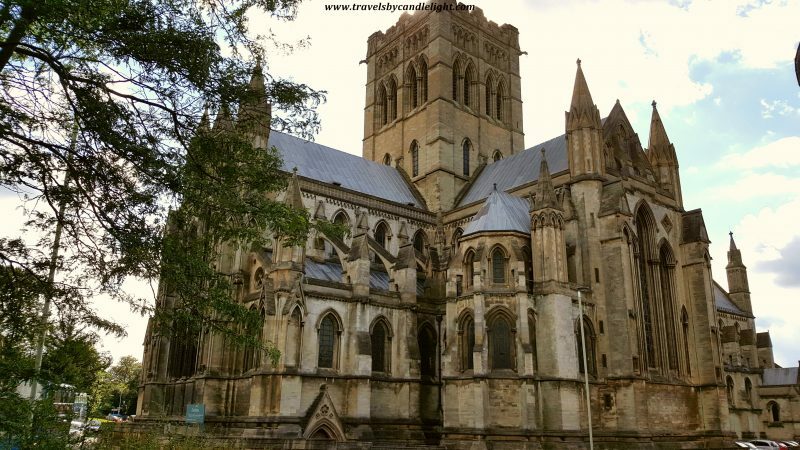 About Norwich, famous for its Norman Cathedral, I only knew that apparently, it is the most complete medieval city in the UK, being as well the only English city in a National Park (Norfolk Broads). Truth be told, I decided to give it a go on a Saturday when I didn’t have anything else planned and it just happened to find a good train tickets deal. 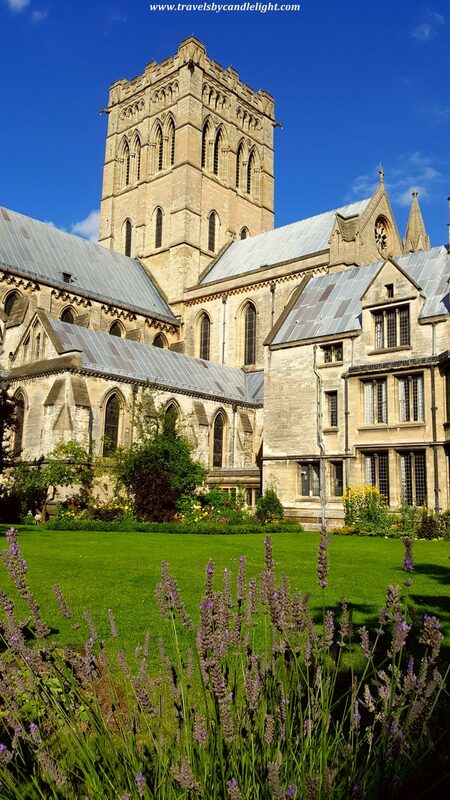 Well, travellers, by any means, I wasn’t expecting to be impressed by its beauty, but Norwich turned out to be a pleasant surprise and a day wasn’t enough for me to finish exploring all his treasures. You need to know that, during the 11th Century, Norwich was the largest city in England, after London – let me tell you what I have unveiled. I got on the train who took me directly from Liverpool Street to Norwich – a journey of about 2 hours which I used wisely to study the printed map of the city I had with me and try to figure out my trail for the day, so that I make sure to cover all the point that worth seeing. I started and ended mu journey with The Cathedrals. Yes, it is a plural because Norwich haven’t got only one, but two cathedrals, both with stunning architecture and bursting with history. 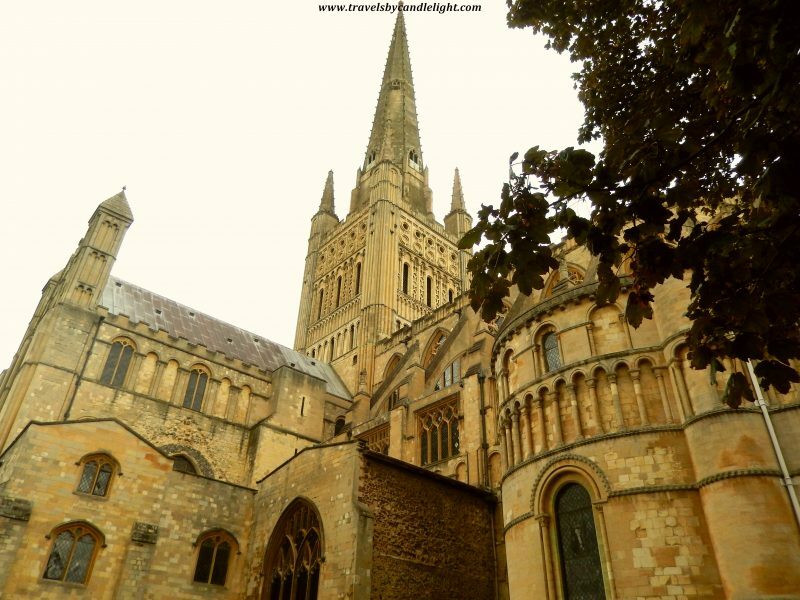 The first stop was at the Norwich Cathedral (after all this was the reason I decided to visit the city) and once you step into the Cathedral close, you seem to be landed in another world full of peace and tranquillity. I do recommend exploring the lanes around the cathedral or stop for a short rest in the Herb Garden or on one of the greens. 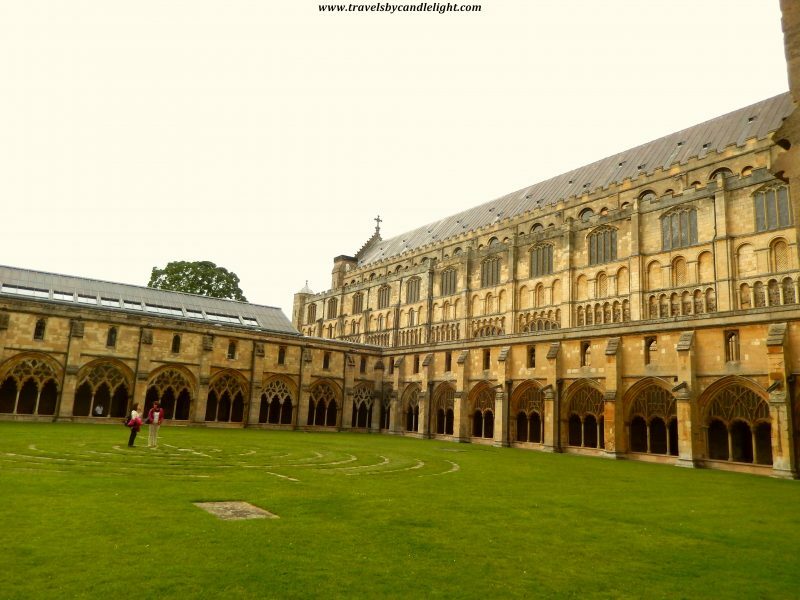 Built about 900 years ago, in a Romanesque style, it is said to have the Highest Norman Tower and largest monastic cloisters in England (you should make the difference to Salisbury Cathedral who has the largest non-monastic cloisters in England). Entry is free and I was lucky enough to catch a free 1-hour tour led by one of the volunteers which told about the rich history of the place. One of the highlights of the tour was the unique medieval roof of the Cathedral has more than a thousand Bible stories carved in stone (although it is quite high to really see the details of the carvings). 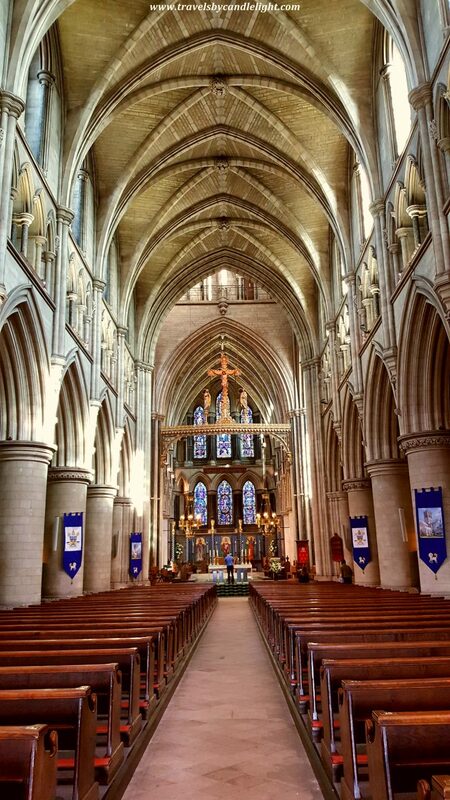 However, although I really liked the Norwich Cathedral, my favorite was the other one, lying across the city – the Cathedral of St John the Baptist, one of the finest examples of great Victorian Gothic Revival Architecture in the UK, with amazing stained glass and stonework. Despite being only 100 years old, it has such a strong medieval look and feel, most probably because of the architectural style. If you have a head for heights you should book a Tower Tour, which happens once a day around noon and I misses it as I got there late in the afternoon. Hence, I headed out to the beautiful sheltered Cathedral gardens, with such a superb view on the cathedral architecture. It was very inspiring for me – I sketched the article about Norwich while sitting on a bench in the peaceful garden and listening to the silence around me. 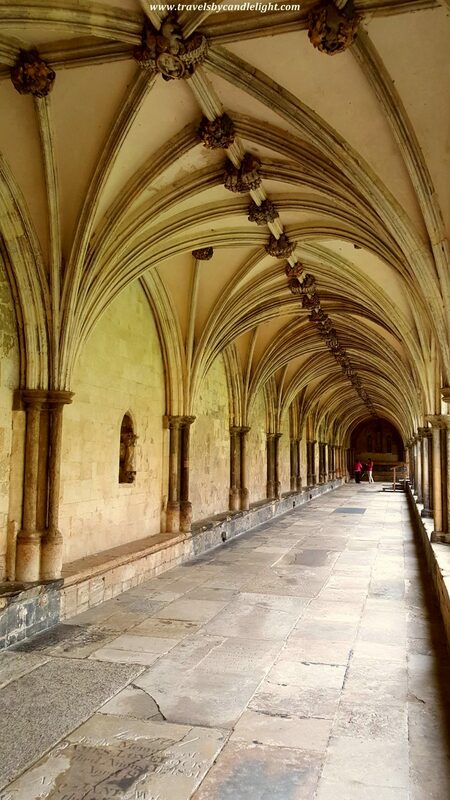 Now, between visiting the cathedrals, here are few other places that definitely deserve a go when going to Norwich. 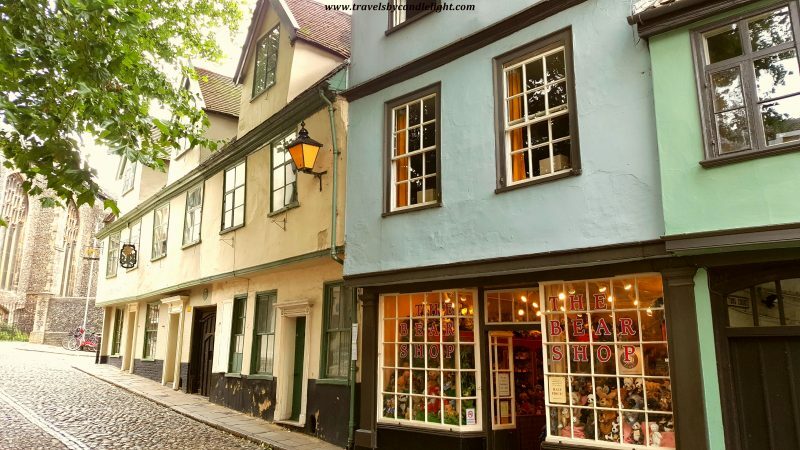 After leaving the Norwich Cathedral, I headed out to Elm Hill, a charming cobbled street, filled with independent specialist shops selling antiques, crafts, collector Teddy bears, jewelry, books, housed in colourful buildings. 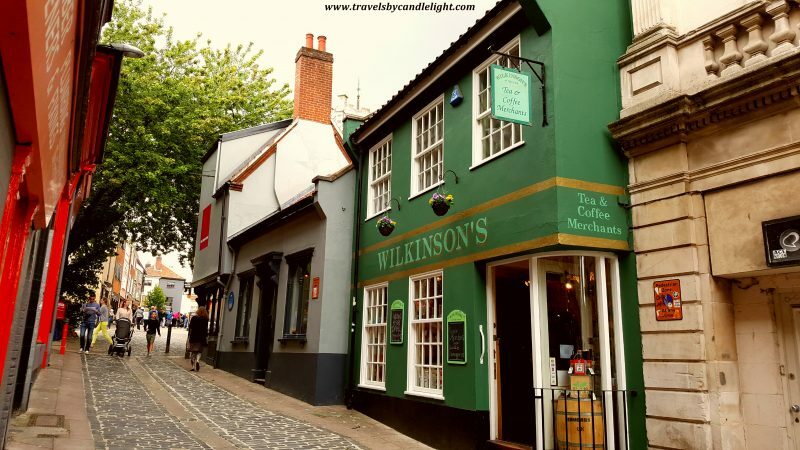 Then, there are the Norwich Lanes, again attractive cobbled streets, now lined up with a dazzling mix of independent boutique shops, galleries, cafes and bars. Norwich has two charming museums housed in historic buildings: The Museum of Norwich at the Bridewell and Strangers’ Hall. While the Bridewell tells the story of Norwich and its people, Strangers’ Hall is a living dolls house, a medieval merchants home where each room (and there are many) is dressed for a different era. I didn’t get inside any of them, as it would have taken me at least 2-3 hours to explore them and I wanted to walk more around the city. Well, this is a good reason for me to come back in the future. There is a castle as well, which sits proudly on a mount high above the city. 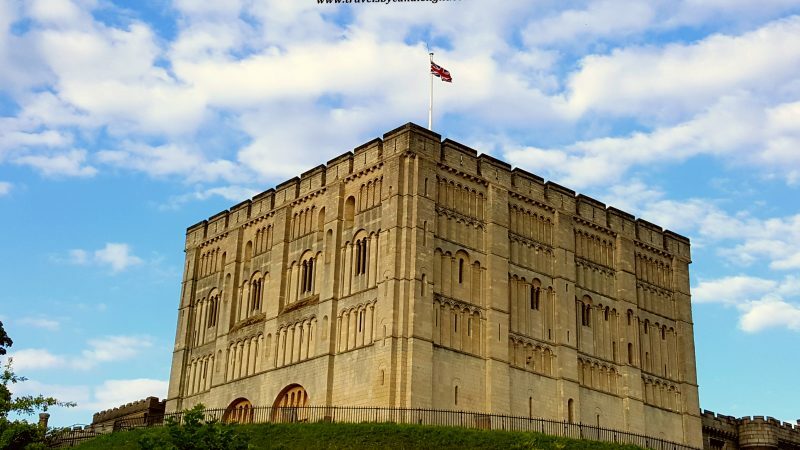 Founded by William the Conqueror, at one point housed a dungeon, and then a Victorian prison, but nowadays hosts impressive exhibits of fine art, archaeology and natural history (including the largest collection of paintings by the unique Norwich School of Artists and the largest collection of ceramic teapots). I didn’t get the chance to visit it, it was already closed for the day when I got there. 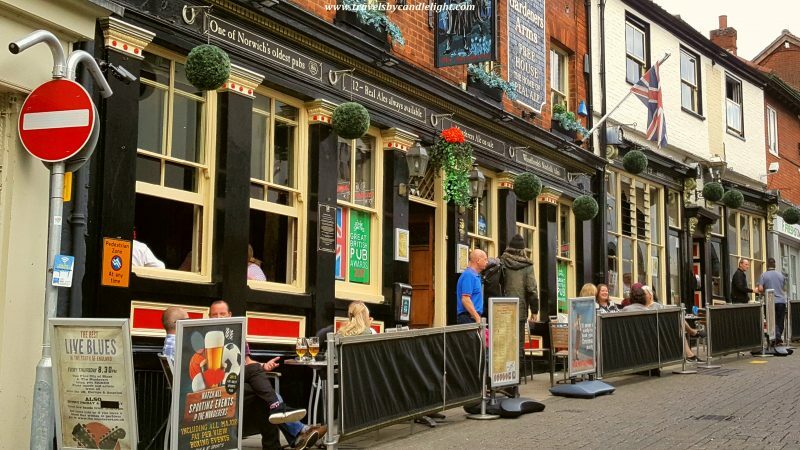 To end up with an interesting thing about Norwich is that it’s England’s first UNESCO City of Literature and the UK leading centre for crime writing – they do have the annual “Noirwich Crime Writing Festival” along with many literary events at bookshops, cafes, pubs and at the wonderful medieval Dragon Hall. One more reason for me to love this city, I would say!